For most of the year the people of Durban are affable, kindhearted and gentle-natured but during rugby season they go into musth – becoming agitated and aggressive. Winning is not a habit that comes gracefully to the average Sharks* fan – and my phone battery steadily drained as a constant influx of obnoxious messages bombarded my social media accounts. * In biblical times lepers would alert others to their presence by wearing a bell. The modern-day equivalent of this are the stickers Sharks fans very considerately put on their cars. This provides a handy alert to the general population, allowing us to give them as wide a berth as possible. A Sharks bumper sticker is the best way to ensure those behind you keep a safe following distance – you don’t want to meet a Sharks fan by accident. 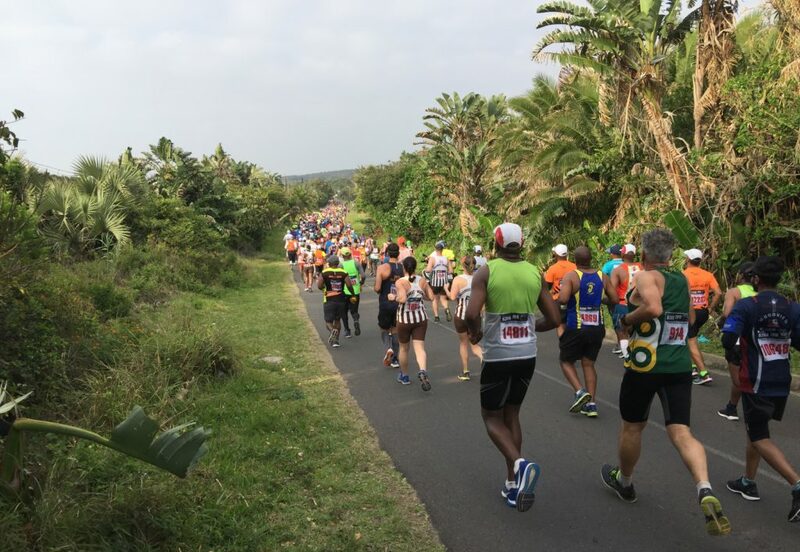 The marathon is run point to point from Scottburgh to Amanzimtoti (25km south of Durban). Race registration is at the finish line at Hutchinson Park in ‘Toti’. It’s a pre-entry only race, will cost you R250 (18$/£14) and included a high-quality shirt for those that entered before 9 September. From registration, it’s a 20 minute walk to the train station – a feature of the race is a train ride to the start, but this does necessitate a very early wakeup. The race instructions explicitly warned us to be on the platform for a 5am departure as time waits for no man and South African trains wait for even less. There are many things that are slowly disappearing from daily life in 21st century South Africa and working trains* are one of them. The Passenger Rail Agency of South Africa (PRASA) are responsible for the well-being of South Africa’s train network and recently restocked their fleet via a R3.5billion order for 70 new locomotives. Flouting tender procedures and ignoring the warnings of senior rail engineers, they pushed the deal through despite the fact that the trains are too large (roof height 4,264mm) to operate on the local infrastructure (max height 3,965mm)**. * In a counter intuitive move, the commuters in Cape Town actively hasten the extinction by regularly firebombing late-running trains. I am not sure of the logic – being late for work is frustrating but, since the trains are no longer steam powered, burning the carriages is unlikely to make them go any faster. ** There is in fact a PRASA running club (they run in a grey kit). 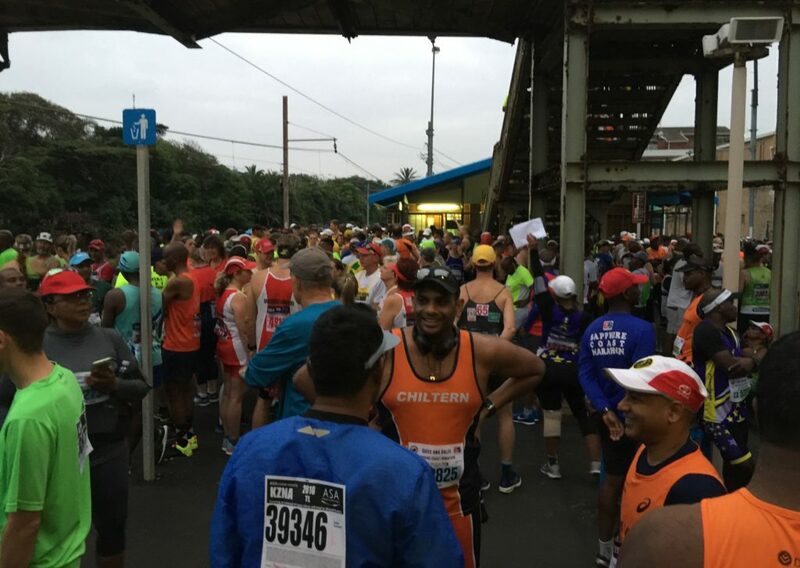 If you spot a PRASA runner it’s good form to ask them if they are running in shoes that are two sizes too big for their feet and then listen to their colourful (but sadly unprintable) responses. Waiting for the train in the dark. In fact, it was a good thing we weren’t in Cape Town as PRASA decided to give us an authentic railway commuter experience and the train arrived over half an hour late. This had a knock-on effect for the race start which as delayed until 6:30am. 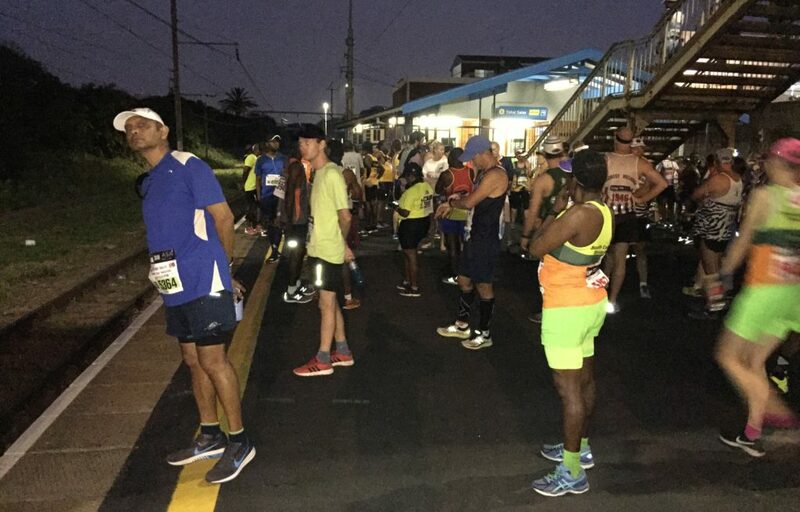 The sun rises early and heats up quickly at the KZN coast so this was not ideal for the runners. Waiting for the train in the light. 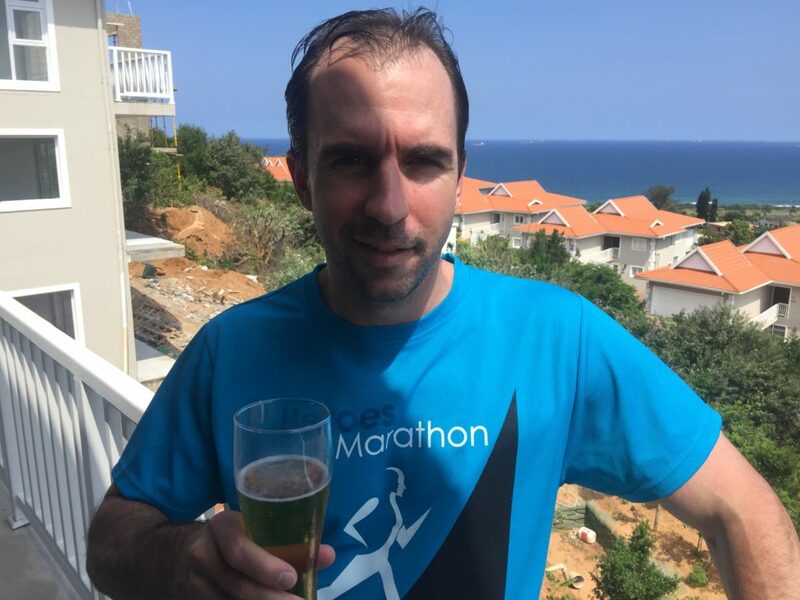 After completing the Two Countries Marathon in Musina earlier this year, my definition of running in the heat has been irrevocably altered – and I now consider temperatures in the high 20s (+/- 84°F) to be light and breezy. 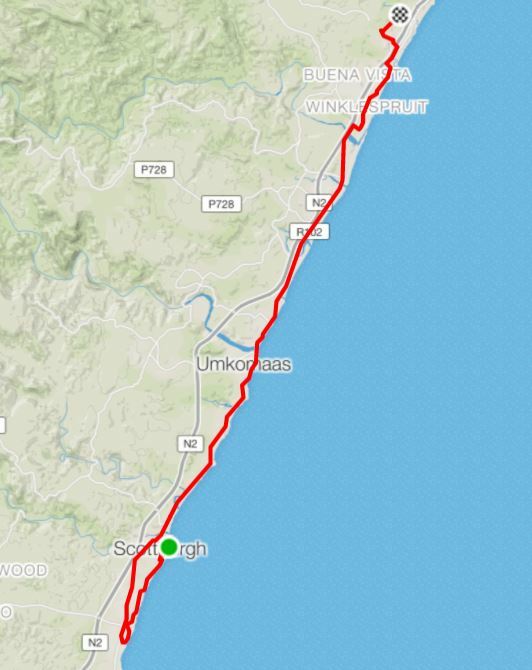 However, running in 100% humidity is not something I’m used to and this led to much huffing and puffing on the initial 8km loop around Scottburgh until my body regulated itself. 1,500 Marathon runners eagerly depart at Scottsburgh station. I mentioned that running a marathon the day after the Sharks win the Currie Cup is a bad idea. Luckily, I made it difficult to detect my Cape Townian origins as I was heavily disguised in my Fourways* running kit and Central Gauteng license plates. However, the big problem was that in the aftermath of an unexpected victory, the Sharks fans seemed to have gone into an unprecedented drinking frenzy and quite literally drank their villages dry. Unfortunately, this meant that there was no water or Coke at the first three tables. * Boksburg runners in their blue and white hoops might not get off so lightly. ‘Water, water everywhere, Nor any drop to drink.’ (The Rime of the Ancient Mariner – Samuel Taylor Coleridge). I’ve watched enough of Discovery Channel’s Shark Week to know that Sharks and freshwater rarely mix. Perhaps this is why there was no water at the first three stations. I also know that Sharks despise cold water which may explain the lukewarm water and Coke we had during the rest of the race. Aside: Official response from the organisers. The late start and a record field compounded the problems. The organisers did send out an apology SMS shortly after the race and I’ve included their comprehensive response to my question on the issue below. They have promised to address the problem next year. However, it is highly unlikely that the Sharks will win another Currie Cup title in the next decade, so this is probably a problem that will resolve itself. This year was the 30th running of the marathon and the 13th year that the local, family owned engineering firm of Goss & Balfe have sponsored the race. It was also a record breaking year for entries. Last year there were just under 1,000 finishers in the half and full marathon combined and this increased to almost 3,000 in 2018. A 10km was added to the menu this year which boosted numbers by an additional 300 runners. The figures would have been even higher had almost 10% of the field not dropped out during the race (which must be one of the highest DNF rates for South African marathons). Goss & Balfe specialise in the upgrading and maintenance of plants and equipment, installation of new equipment and materials handling within the Chemical, Petrochemical and Mining Industries. Check out their offerings here. One of the many rivers and estuaries crossed during the marathon. 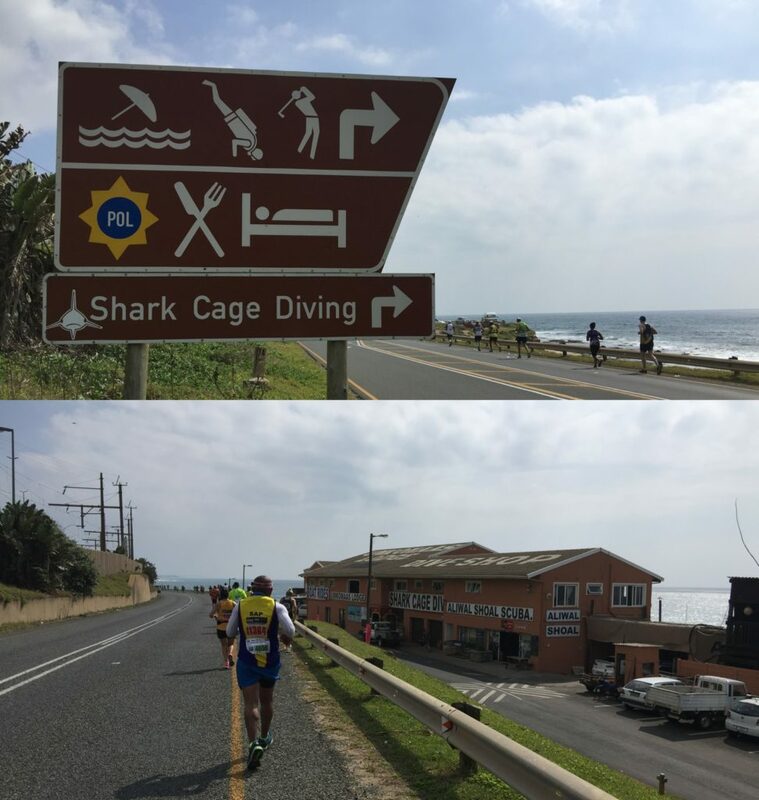 After negotiating the loop around (and climb out of) Scottburgh you spend the rest of the race hugging the coastline along the R102 while you traverse through the villages of Clansthal, Widenham, Umkomaas*, Ilfracome and Winkelspruit. * Umkomaas means ‘place of cow whales’ since large numbers of humpback whales used to give birth and nurse their young in the shallow waters of the estuary. 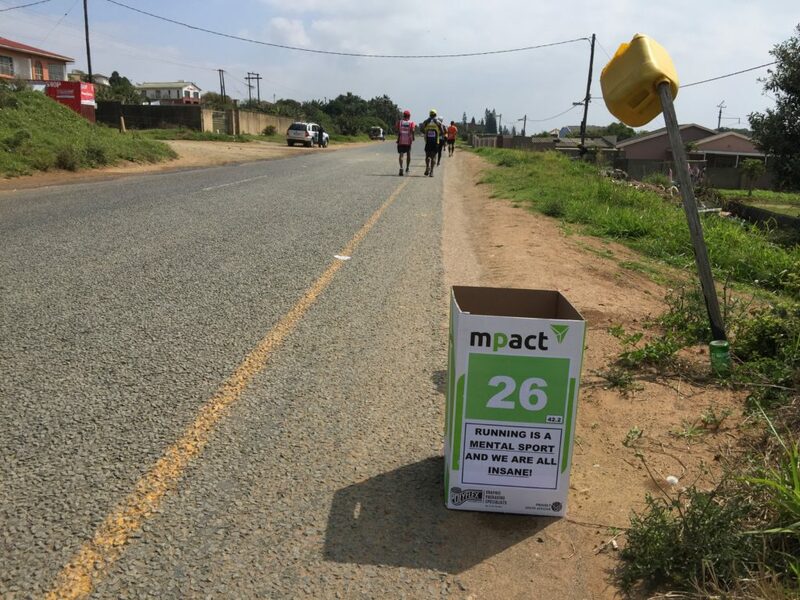 It makes sense to double up your kilometre marker boards as rubbish bins to #RunClean – but the organisers of the Sapphire Coast Marathon pull off the triple play with motivational messages as well. This one resonated with me as we headed through Umkomaas. Although you are right next to the sea, ocean views are not constant such is the thickness of the lush, tropical bush that typifies this part of the world. Heading through thick tropical bush. 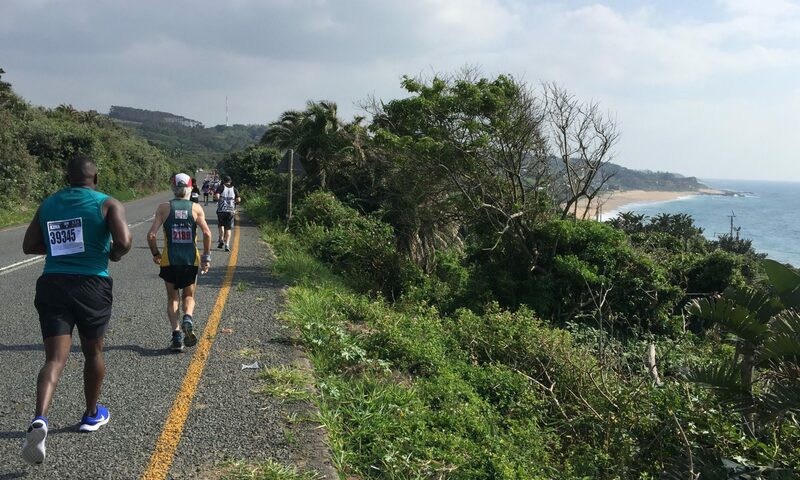 If you thought a marathon along the Kwazulu Natal South Coast would be flat you would be wrong. I have a tendency to be verbose in these race reports but this route can be summed up quite simply as: 42 kilometres of unrelenting undulations with heat and humidity as your constant companions. In fact, I would say the race profile looks a lot like the mouth of a ragged tooth shark*. This is appropriate since the best place to see raggies in real-life would be to take a 5km offshore detour at the halfway mark – the launching spot to get to Aliwal Shoal. This is a volcanic reef renowned for being one the best diving spots in the world to view tropical/subtropical fish and salt water predators. Ragged tooth sharks gather here in large numbers between July and November to mate** which provides spectacular viewing for recreational divers. * That’s the grey nurse shark for people who prefer boring animal names. ** Matriculating Gauteng students gather along the Kwazulu Natal Coast in large numbers every December also hoping to mate. I understand the male ragged tooth sharks have a far higher success rate than their terrestrial counterparts. If you get bored of pristine coastline & need some excitement you can go for a quick shark dive just after halfway mark. Interesting Fact: The only thing worse than an actual shark bite is the constant gloating of Sharks Fans after winning the Currie Cup! After crossing many rivers and estuaries you finally reach the streets of Amanzimtoti. Ironically, considering the hydration situation, the town’s name means “Sweet Waters”. Legend has it that King Shaka drank from the river and exclaimed, “Kanti amanzi mtoti” (“So, the water is sweet”). Some cities have a red light district but Amanzimtoti has a gold-plated Pawn Parade. I’m not that big on pawn – but a few prawns (& beer) always goes down well after a tough coastal marathon! Sometimes, it pays to run a little slower. 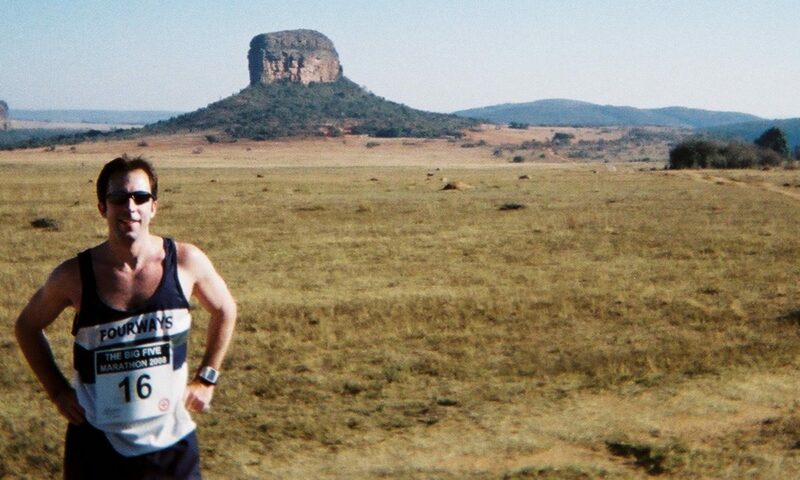 Natal Midlands runner, Greg Strachan, finished a few minutes ahead of me only to find that there were no refreshments left after collecting his medal. Instead he was offered a nice hot cup of coffee* – not the ideal beverage in 30°C (86°F) heat after you’ve sweated profusely for four hours in the tropical humidity. When I finished they had replenished the stocks and I managed to scrounge a solitary water sachet which got me through to lunch time – where a few beers and some seafood went down spectacularly well. Greg from the Midlands is not impressed with the post race drink options. * People from the Natal Midlands have sophisticated tastes. Even on a cold day, it is unlikely any self-respecting Midlander would accept a ‘normal’ cup of coffee. Had Greg been offered a latte ground from hand-picked, fair trade coffee beans, lightly infused with the essence of free-range almonds and diluted ever so slightly with skimmed soya milk it would have been a different story. Post marathon recovery, South Coast-style. Fully satiated after lunch, it was just the flight home to go. Running marathons all around the country means I spend quite a bit of time away from my family so I booked a more expensive earlier flight on Kulula to ensure some quality time with my kids before their Sunday evening bedtime. Kulula is the market leader in delayed flights. As such, they have optimised their communications systems around flight delays and I received a steady stream of text messages as the estimated departure time was steadily pushed back. 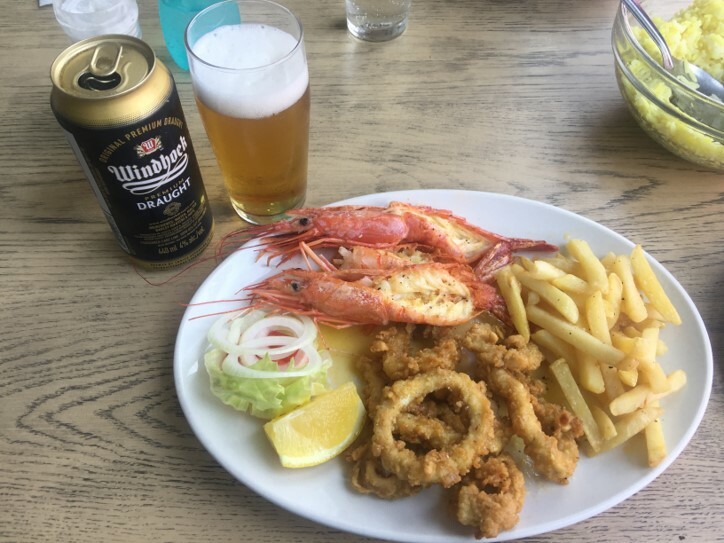 I try to be a glass half full, silver lining guy and the Bidvest Lounge makes this easy to achieve – I ensured my glass was never less than half full of beer and silverlined my stomach with a steady supply of chicken wings. 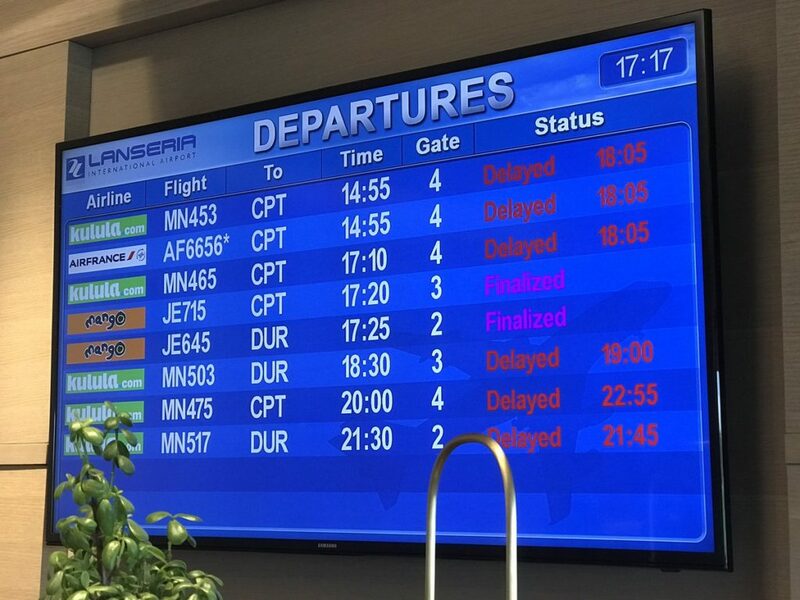 Kulula has a proud history of turning flight information boards red (Photo from the Twitter account of Derrick Carolin). However, there is only so much comfort eating one can do – and I ruefully watched the cheaper, later flight depart on time as the expected departure of my flight increased more rapidly than the petrol price. I got to know the lady at the reception desk quite well during the course of the evening and she displayed great empathy consoling me with, “Don’t worry, last weekend the afternoon flights only left after midnight”. Our flight finally began boreding (sic) and Kulula sweetened the deal by moving me from the aisle seat I had booked to a middle seat – and of course I was seated between an obese gentleman on the left and a drunk dude on the right (one of the additional hazards with delayed flights). At least the flight home was a short 60 minutes of uncomfortable confinement. As my stiffening legs searched for centimetres to move, I reflected that marathon running is actually quite easy compared to the consequences of getting PRASAed beforehand and Kululaed afterwards. I Tweet from two accounts (one is for running and the other pseudo-professional). Kulula responded to my running account with a rather jovial ‘sorry but well done on the marathon’ reply. The other account got a reply the following day to my ‘middle seat sweetener’ update with the promise that an agent would be in touch. The customer care agent sent me an email the next day and I received a R500 voucher towards my next flight. 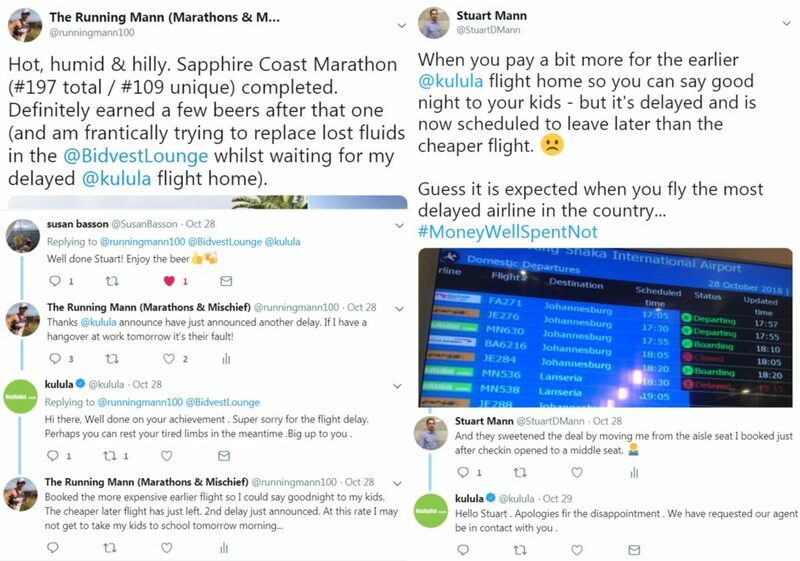 Original Tweets and selected comments from my Twitter engagement with Kulula. The apology letter I received from Kulula. I recently helped out a few cashflow challenged runners with interest free, trust-based loans to cover Comrades and Two Oceans entry fees (and subsequently managed to find some sponsors to subsidise/pay for additional entries). However, even with a sponsored entry, there are many brilliant runners who simply cannot afford the travel costs*. 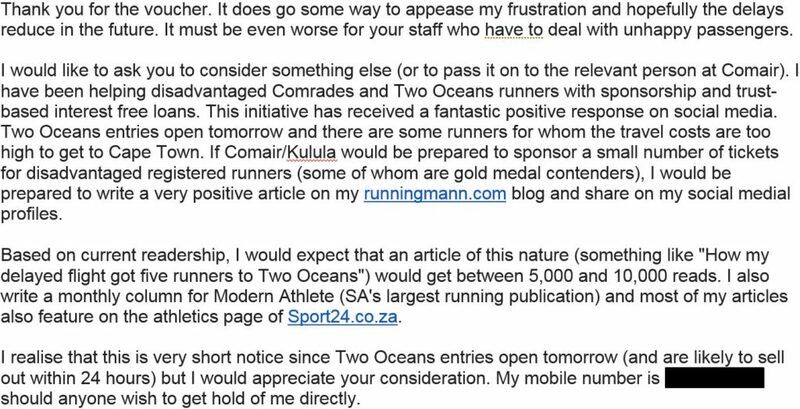 I therefore decided to try my luck by sending the Kulula representative who had contacted me a “How about a few free flights for disadvantaged ultra runners in exchange for a nice article” email. * Big races like Comrades and Two Oceans provide a runners’ village for disadvantaged athletes so accommodation is less of an issue. My “How about a few free flights for disadvantaged ultra runners in exchange for a nice article” email. To be honest I was not expecting a response but received the following shortly thereafter. Fazila’s thumbs must be getting tired waiting for the reply from her marketing team. Unfortunately, it looks like this is where the story ends. I would have been very surprised – but delighted – had they sponsored a couple of runners. A simple ‘sorry but we are already committed to a number of other sponsorships’ or even a ‘we don’t do that sort of thing’ would suffice. Unfortunately, I got crickets from the ‘marketing team’. But perhaps there is still a chance – maybe the marketing team’s reply is merely delayed and, like a Kulula passenger stranded in a South African airport, will eventually reach its destination. Signing out from the South Coast. Look out for the next report from the Music Marathon in Bloemfontein. Another very good and amusing read Stuart. I am impressed by your attempt to bring Khalula on board with some sponsorship. It’s a wonderful idea, and I really hope they pick up on it.